Anniston became a breakout star on the Emmy winning sitcom Friends—and with film hits like The Break-Up, Just Go With It, Horrible Bosses, and Marley & Me, Jen is one of the highest paid actresses in Hollywood. In December 2018, Netflix released the coming-of-age comedy Dumplin’, with executive producer Aniston starring as a mother in the film written by Kristin Hahn, her partner in Echo Films, which produced the movie. And, on this day in 1931, Burt Reynolds was born. The Hollywood star and romancer might never have become an actor had he not been injured as a star football player at Florida State University. An English teacher later convinced him to try out for a play based on his reading of Shakespeare in class. Reynolds got the lead and won the 1956 Florida State Drama Award for his performance. 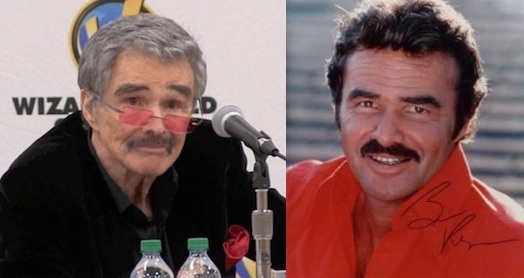 Over his long career, the actor, director, and producer starred in, and won awards for, many television series and feature films, such as Deliverance, The Longest Yard, Smokey and the Bandit, and The Cannonball Run. Reynolds underwent a quintuple heart bypass in February 2010. Yet, still in 2017, he acted in four film projects before his death in 2018. Check out his latest memoir.